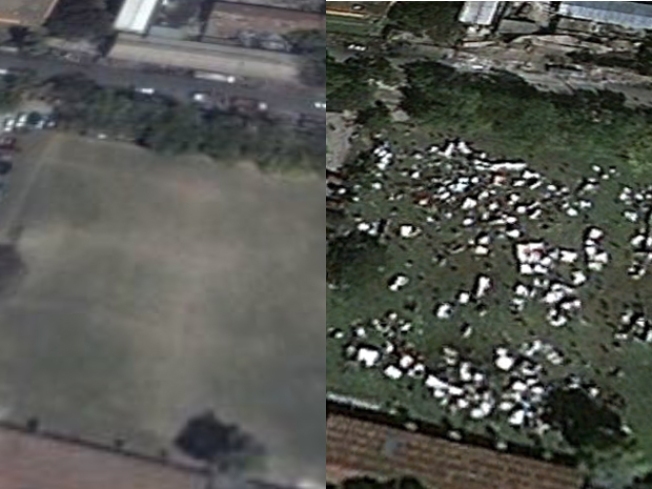 Images from Google Earth before, left, and after, right, the recent earthquake in Haiti reveals what looks like temporary structures and people finding shelter in an open field in Port-Au-Prince. Partnering with satellite imaging company GeoEye, Google has released updated images of Haitian capitol Port-au-Prince in the wake of the tragic earthquake which may have left 100,000 dead. The images are part of a downloadable file that can be viewed in the company's Google Earth mapping tool. The Google Maps and Google Earth teams have released similar updates to its tools in the past, including in the wake of a massive hurricane which struck Haiti, the floods which struck New Orleans and the gulf states after Hurrican Katrina. The move comes after relief organizations asked the company for images of what to expect on the ground, and it might help target areas hardest hit. Before-and-after images show massive destruction, with whole neighborhoods devoid of traffic and historic landmark buildings in ruins. If the sight moves you to do something, here's information on how to help. Jackson West wonders if there's any significance to the fact that detailed, up-to-date satellite imagery of places like Haiti is only provided in the wake of tragedies.